There are three ways to create an event on Zoho Calendar. The Smart Add feature helps you create an event by identifying the event details from just a single sentence entered. For eg: If you have entered "Client Breakfast at 9 am on Monday", the feature immediately creates the event as "Client Breakfast" for the coming Monday at 9 am. 1. Login to Zoho Mail and navigate to the Calendar. 2. Click on the "+" icon on the top left side of the calendar. 3. Fill the event details to create the event and tap Enter. 4. Your event is now added to the calendar. Smart Add is available only for the English version of Zoho Calendar. The date entered in Smart Add should be of the format "mm/dd/yyyy". Use the '?' help icon in the Smart Add window to know about the syntaxes supported in Smart Add. Cricket Tournament from 3rd June to 29th August. Creates an all-day event with the event title "Cricket Tournament" from 3rd June to 29th August in the current year. Coding Marathon from 20-Jun-2019 to 01-Jul-2019. Creates an all-day event with the event title "Coding Marathon" from 20th June 2019 to 1st July 2019.
Business meet from July 2nd to August 13th. Creates an all-day event with the event title "Business meet" from July 2nd to August 13th of the current year. Partners meet from 3-5 pm. Creates an event with the event title "Partners meet" from 3-5 pm for the current date. Team meeting from 10 am to 11 am. Creates an event with the event title "Team meeting" from 10 am to 11 am for the current date. Security Exhibition from Monday to Friday. Creates an all-day event from Monday to Friday of the following week with the event title "Security Exhibition". State book fair next Friday. Creates an all-day event for next friday on your calendar with the event title "State book fair". Start-up meet from today till day after tomorrow. Creates an all-day event from today till the day after tomorrow with the event title "Start-up meet". Website designing contest from tomorrow to weekend. Creates an all-day event from the day after the current day till the end of the week with the event title "Website designing contest". Tech conference from Aug 12 for 3 days. Creates an all-day event for 3 days from August 12th with the event title "Tech Conference". Marketing Discussion for 2 days. Creates an all-day event from the current day, for 2 days with the event title "Marketing Discussion". Meet Paula in 3 hours. Creates an event for a default time period of one hour, 3 hours from the current time with the event title "Meet Paula in 3 hours". Client meeting for 2 hours tomorrow. Creates a 2-hour event the next day, at the date with the event title "Client meeting for 2 hours". Meeting Roger at Breakfast tomorrow. Creates an event with the event title "Meeting Roger" for the next day at 8 am. Catching up with Lara at Lunch on Sunday. Creates an event with the event title "Catching up with Lara" at 12 pm on the upcoming Sunday. Team get-together at Dinner on Monday. Creates an event with the event title "Team get-together" at 9 pm on the upcoming Monday. 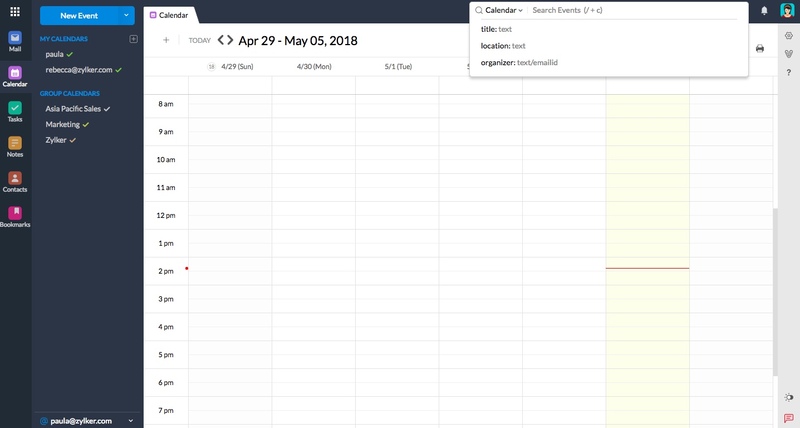 You can create an event by clicking on the grid of the calendar. If your event stretches across several hours or days, click and drag your mouse to the desired duration of the event. This will display a simple event creation box with three basic fields. 1. Enter the event title in the field. 2. Mention the location where the event is happening. 3. Pick the calendar to which the event should be added. After specifying these three fields, click on the "Create" button to add the event. For further customization of the event, click on "More details". 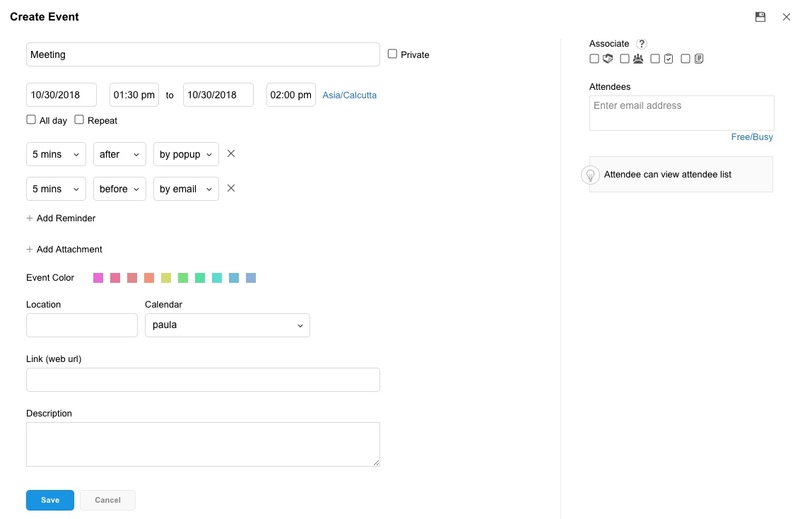 This will display some advanced options such as assigning reminders, scheduling recurring events, etc. The Detailed Add version of creating an event comes with all the options that can be used to customize and create an event. 2. Click on the New Event button on the top left pane of the screen. 3. Enter the Event Title. 4. You can change the Time zone for an event irrespective of the Time zone that is set for your Zoho Calendar. When you set a different Time zone to the event, your event will be created for that particular Time zone. 5. Enter the Time duration, Color and Location. 6. Select the Calendar to which you want to add the event. 7. You can add the reminder, attachment, description and web URL linking to the event. 8. Click Save to complete creating an event. Some events on your schedule might have to be repeated every once in a while. 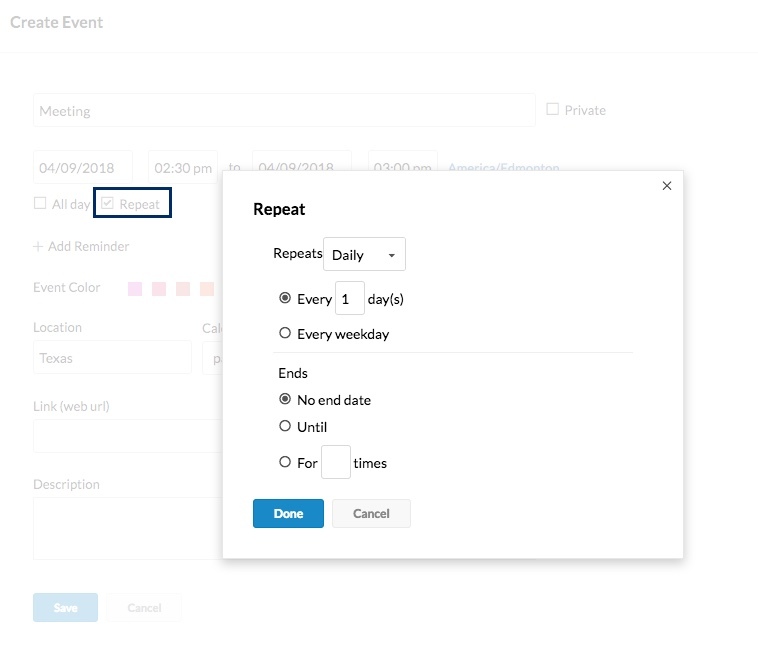 To make the scheduling easier, Zoho Calendar helps you create an event with repeat option. 2. Click New Event from the left pane of the screen. 3. In the "Create Event" window, select the "Repeat" option. 4. When the Repeat window appears, enter the "Repeat" period and when the repeating "Ends". 5. Click Done and Save the event. If you have an event that is happening for an entire day, you can create an event as an "All-day" event on Zoho Calendar and update your free/busy status. 3. In the "Create Event" window, select the "All Day" option. 4. Click Save and the event is created for the entire day. You can add an event and limit the visibility to "only you" or certain people that you add as attendees. Even if your calendar is shared as public, the event cannot be viewed by others. 3. In the "Create Event" window, select the "Private" option. 4. Click Save and the private event is created. After adding an event on your calendar, the event will be displayed with the "Time" and "Event Title". 2. Click on the event you have added on your calendar. 3. In the pop-up, click View. 4. The event details will be displayed. You can make changes to the events any time you want using the "Edit" option. If you want to edit a reminder, change event timings, etc, you can do that using the "Edit" option. 2. Click on the event you have created on your calendar. 3. In the pop-up, click Edit. 4. After making changes to the event, click Save. Events that are created by mistake or events that have been cancelled can be removed from the calendar any time. 3. In the pop-up, click Delete. 4. The event will be removed from your calendar. If you are deleting a Recurring event, you will be prompted to delete either the current occurrence alone or all instances. If you are looking to locate a particular event from a list of events on your calendar, the search option can be used. You can search for events in your calendar using the Event Title, Event Location or the Organizer of the event. 2. Click on the Search bar on the top right-side of the calendar. 3. Choose if you want to search using "Title", "Location" or the "Organizer". 4. Enter the content in the search field and tap Enter. 5. The event list is displayed. You can also access the "Search events" feature in the Calendar using the shortcut "/+c". 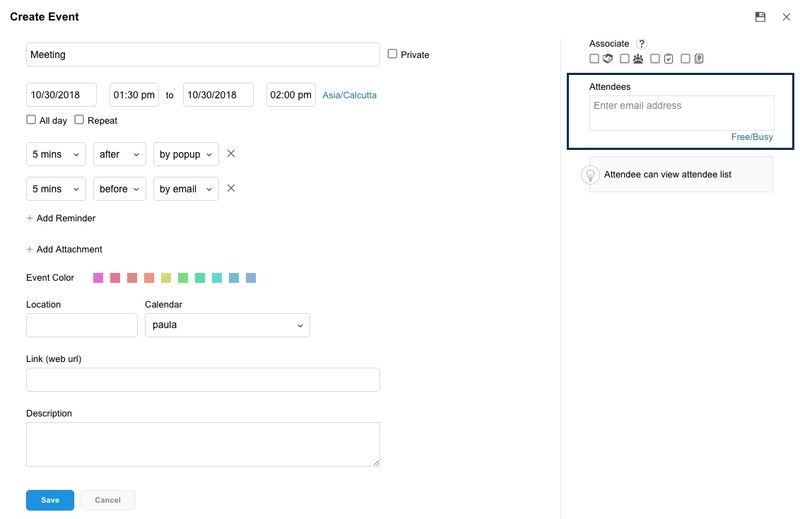 Events created on Zoho Calendar can be customized for different color themes. There are ten default colors available for events. For example, your calendar is filled with both personal and work-related events, you can select two distinct colors for personal and work-related events on the same calendar to help you identify appropriately. 2. Create a new event or click on the event you have created on your calendar. 3. For already created events, click Edit in the pop-up. 4. In the "Create Event/ Edit Event" window, select the color of the event. 5. Click Save to create the event. After creating an event, you might need reminders before a specific period of time to let you know that the event is happening. This helps you adhere to you schedule. Apart from adding reminders for calendars as a whole, you can customize reminders for every event that is added on the calendar. Depending on the reminder criteria set, you will be receiving notifications either before the start of the event or after the event ends. 4. In the "Create Event/ Edit Event" window, click on Add Reminder. 5. Select the following options for setting the reminder using the drop down list: Time duration, Before/After and By email/By Pop-up. If you want to add more details about the event in the form of images or documents, you can include these files using the "Add Attachment" option. Using attachments while creating an event might make it professional and help people understand the agenda better. 4. In the "Create Event/ Edit Event" window, click on Add Attachment. 5. Select the files you need to attach from your desktop. The attachment limit for every event is 10 MB. You cannot attach files exceeding the limit. When organizing meetings in your organization, you need to check the free/busy status of your colleagues before picking the best time for the meeting. In the "Create Event" window, there is an option to check the free/busy status of all the attendees of the event by just entering the email address of all the participants. After checking the free/busy status, you can alter and fix the best time, add the attendees and create the event. The event invitation request will be sent to the attendees and notifications will be dropped through email. After receiving the invitation, the attendees have to RSVP to the event after which the status will be updated to the organizer. 2. Click New Event from the left pane of the screen or Edit an event that is created already. 3. In the "Create Event/Edit Event" window, enter the email addresses of the attendees and check for the Free/Busy status. 4. Set the free/busy slot to "All Times" or "Working hours" from the drop down on the right. 5. Use the "Find next available free time" option to locate the best time for the event and Click Ok.
6. You can also add a particular group that you are a part of in the "Attendees" section. 8. The invites will be sent out to the attendees as an email. If you are creating an event for a past date/time and adding attendees to it, the event invitation will not be sent to the attendees. While creating the event, you will be prompted that the event is a Past Event. When an event is created and an attendee is added, an event invitation notification is sent as an email. The attendee needs to respond to the event invitation as "Yes", "No" or "Maybe" by clicking on the link in the email. Once the link is clicked, you will be directed to the event invitation page in calendar.zoho.com where you have to file your response. 1. Login to Zoho Mail and Click on the "Event Invitation" mail from the Inbox. 2. RSVP to the event by clicking on "View Event" in the event link. 3. You will be directed to calendar.zoho.com where you can file your response. 4. Click Update to register your response. After the status is updated an email will be sent to the host confirming about the status. If you have subscribed to a Group calendar, then you can add events to it. Every time you add an event to a group calendar, the admin/moderator of the group gets notified about it and an email will be triggered. After the admin/moderator has accepted, the event will be added to the Group Calendar. 3. In the "Create Event" window, select the group calendar from the "Calendar" drop down to which you want to add the event. You can open create/view/edit event windows of multiple events in different tabs in Zoho Calendar. So you can make changes simulatenously while navigating between the tabs.